An entire industry has sprung up where hapless scientists, especially those in the early parts of their career, are tricked into paying high publication fees for having their articles published in journals with fancy names that, though supposedly peer-reviewed, will accept and publish any BS paper they get sent, as long as the fees are paid. Some researchers are simply unaware of the nature of these publications and excited to be invited to publish, while others will purposely use them to publish low-quality research that they cannot get through elsewhere. 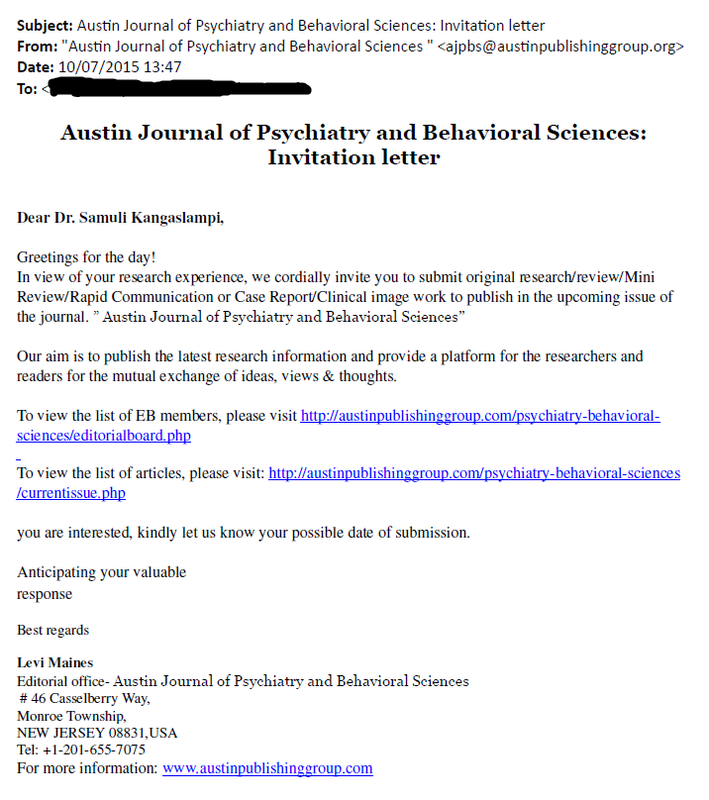 More recently, these predatory activities have expanded from “journal” publication to organizing terrible, over-priced events with names reminiscent of but slightly different from major established academic conferences. Practically all participants at such events will be invited “honored speakers” (who still had to pay relatively high prices to participate), and the arrangements generally chaotic. Lists of speakers and organizers supposedly associated with these events often even include researchers who have no idea their name is used in this way. 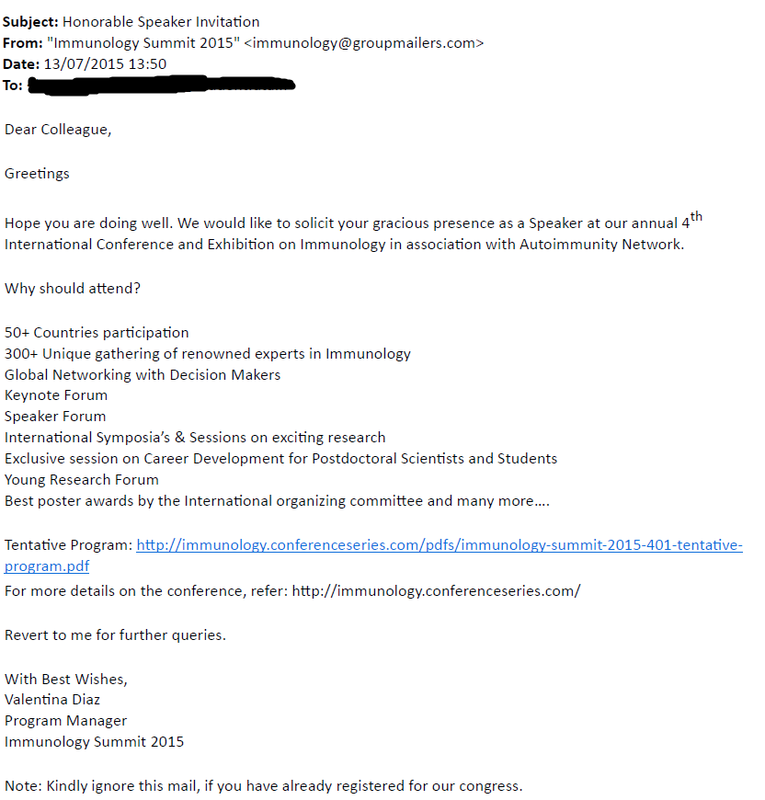 90 % of the invitations/solicitations I have so far received appear to originate from various branches of a single predatory publishing / event organizing company called OMICS Group. The exploits of this shameful excuse for a company based in India have been detailed elsewhere. OMICS, however, is just the tip of the iceberg, as there are dozens of similar publishers, most of them based in India, the Middle East or (South)East Asia. Jeffrey Beall’s Scholarly Open Access blog is a great resource for checking up on the activities of these nefarious scamsters. Naturally, all respectable scientists, aspiring researchers and students should avoid journals and events associated with such predatory companies (especially OMICS!). Not doing so would not only be funding this degradation of science by contributing to their scams, but could also cause serious harm to one’s credibility, if such associations came to light. Not a Doctor, but okay! Greetings to you, too! Thanks for the opportunity, but I think not. The Austin Publishing Group is really based in India, not New Jersey, and likely associated with OMICS. Looking at their website makes me wonder how many of those listed in the editorial board are aware a) that they are on that list and/or b) what level of journal this is. :(. I guess Dr. S. was not quick enough to jump on the opportunity to review this manuscript on something completely unrelated to his research. I don’t recall any past efforts, though. This invitation was from MDPI, a highly questionable Chinese publisher. Not a Doctor, but… I’m doing quite well actually!!! Thanks, but no thanks, OMICS!!! Why should attend, indeed! Somehow, I doubt I’ll honor the event with my gracious presence this time. 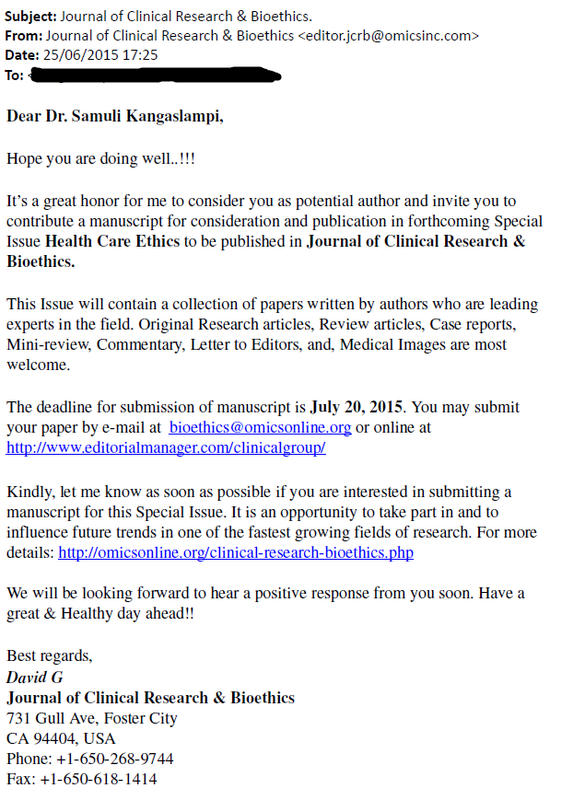 Another OMICS invitation.